DAY 1 : TRAVEL DAY : We personally meet you from Seville airport and drive you to Vejer. Time to get to know your surroundings, meet the other guests and relax after your journey. 20.30 - drinks and dinner. Or choose to travel independently, full directions are provided. DAY 2 : TOUR OF VEJER with sketching : 10.00-14.00 - Gisela Radant Wood takes us on a guided tour of Vejer with time to sketch before lunch. Lunch is a healthy salad with local cheeses and cold meats. After lunch time to explore, relax or sketch. 18.00-19.30 - tutored session of observational DRAWING. I have taught life drawing and observational drawing for more than twenty years and developed a way to help you look more carefully and draw what you see more accurately. This is a good basis for the week, however you choose to sketch or paint. 20.00 - drinks and dinner. DAY 3 & 4 : URBAN SKETCHING AND PAINTING: 10.00-14.00 - tutored session sketching and painting in the town. We start the day with an optional exercise based on observational drawing eg: finding interesting compositions, colour and tone, ink and wash etc. Followed by painting in media of your choice. 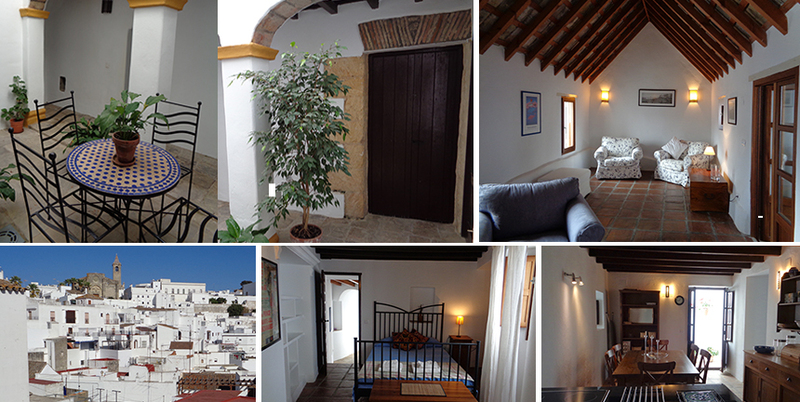 After lunch you can continue sketching or painting or choose to relax and explore Vejer. 18.00-19.30 - tutored session with optional creative exercises. 20.00 - drinks and dinner. DAY 7 : URBAN SKETCHING AND PAINTING : 10.00-14.00 - our final day sketching and painting in Vejer with your media of choice and guidance from Noelle. Time to relax after lunch. 18.00-19.30 - review of week's work with tips and advice about developing work after the course. 20.00 - drinks and FAREWELL dinner. DAY 8 : FAREWELL AND DEPARTURE after breakfast. 08.30: Breakfast. 14.00: Lunches are simple plentiful salads, cheeses and cold meats. 20.00: Delicious dinners with wine. All meals at Casa al-manzil included. Lunches on Days 5 and 6, drinks or refreshments in bars and cafes are not included in price. Top: painting from the roof terrace, sketching overlooking the sea on Day 6, sketching in Vejer. Bottom: sketching in Cadiz Botanical Gardens on Day 5, view of sunrise from roof terrace, painting in Vejer. VENUE: We stay in CASA AL-MANZIL a traditional 17th century Moorish townhouse with an open central patio and a roof terrace with fine views. This is a private house with beautifully preserved features, offering guests the opportunity to stay in the heart of the historic old town. CASA AL-MANZIL : Three double bedrooms. Two bathrooms with WC, basin, bath and/or shower. All rooms suitable for single or shared occupancy. Private courtyard and roof terrace. Not all of the rooms are ensuite. It is possible to reserve an ensuite bedroom, but these have to be allocated on a first come first served basis. Please note: the steps are steep and unsuitable for anyone with mobility issues. We use local accommodation for additional guests, gathering at Casa al-manzil after breakfast and returning after dinner.